Kenneth Faried is the type of basketball player that does one or two things so well that the rest of his game continually goes underrated. In Faried’s case, the two standout talents are his rebounding and his energy, hence the popular comparisons to Dennis Rodman back when the 6-8 power forward was drafted by the Denver Nuggets out of Morehead State three years ago. Which means that Faried isn’t getting enough credit for the offensive skills and nuance in his high-octane style. Faried’s shown an improved post game, with the ability to turn over either shoulder and nail a jump hook, but his jump shot is still a work in progress. He’s shooting 35.4 percent on jump shots this season according to NBA.com. But … Faried is actually shooting an above average percentage from 8-16 feet, where he typically catches the ball on the elbow in Denver’s offense. Defenders haven’t started honoring Faried yet from that distance — when they do, it will clear up more space for Faried to drive to the basket and use his explosiveness to finish at the rim. Faried is averaging 11.9 points and 7.8 rebounds this season, right in line with his career averages, but he was struggling in the early on. Faried credited his recent breakout to Denver point guard Ty Lawson’s return to the lineup from injuries, but it probably also had a little something to do with Faried’s frame of mind. 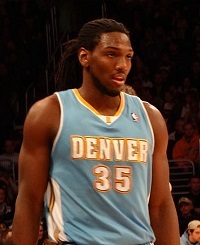 Faried’s name had been tossed around in trade rumors for months leading up to the NBA’s Feb. 20 trade deadline. Hours after the deadline passed and he was still a Nugget, Faried put up 26 points against the Bucks to help Denver snap a five-game losing streak.